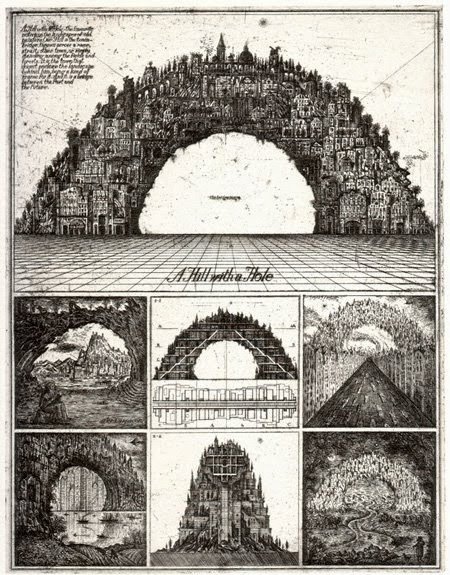 If you're in London, you can see Brodsky and Utkin's fantastical paper architecture in person at the Tate Modern. Otherwise, try on the internet, because the book of their work starts at $245!! These two artist/architects are part of a movement called Paper Architecture, buildings which exist only on paper. Which is pretty much what fantasy writers do as well. Their work really got me excited about the world-building aspect of urban fantasy all over again. Italo Calvino's Invisible Cities is like a catalog of imaginary urbanism: cities on stilts, temporary cities, cities of earth... Did Marco Polo visit them on his travels or is he really telling Kublai Khan about fifty-five different versions of Venice? Who knows, but each one of the cities could be the basis of a whole novel. I was going to quote from one of them, but this little snippet of conversation seemed to go best with the Brodsky and Utkin above. 'But which is the stone that supports the bridge?' Kublai Khan asks.